From the L23F derivative of the Model 50 Twin Bonanza Beech developed the civil Model 65 Queen Air. On 28 August 1958 Beech flew the prototype, designed as a seven/nine-seat low-wing monoplane with retractable tricycle landing gear, the 65 Queen Air was powered by two 254kW / 340-hp Avco Lycoming IGSO-480-A1B6 flat-six engines. Full IFR instrumentation was standard, and optionally available equipment included autopilot and navigation and weather-avoidance radar. In January 1968 Beech flew the first of three Model 65s that were to be used by the US Army for evaluation. 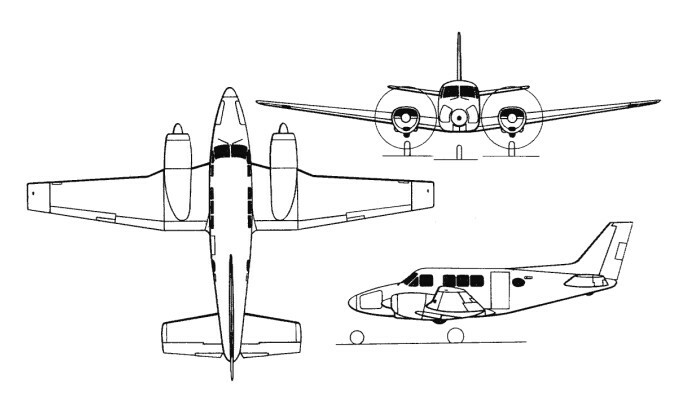 This resulted in orders totalling 71 aircraft, under the designation L-23F Seminole, an identification chosen because of the general similarity between the Twin Bonanza and Model 65 Queen Air. In 1962 the L-23F was redesignated U-8F, and some modified at a later date to provide improved interior accommodation became U-8Gs. A number of commercial Queen Airs were acquired by the Japan Maritime Self-Defence Force, for use in navigation trainer and transport roles, and others went to the air forces of Uruguay and Venezuela. 58-1354/1356, 60-3453/3463, -5386/5390, 61-2426/2430, 62-3832/3875, 63-12902 (also as YU-21), -13636/13637, 66-15365, 1 for Pakistan 63-7975, and 3 impounded drug-runners 81-13658/13659, 83-24370, the latter returned to service as QA-65. An improved Model A65 Queen Air had swept vertical tail surfaces and greater fuel capacity; and a version with a high-density seating arrangement for a crew of one or two, with 10 or nine passengers respectively, was known as the Queen Airliner. A Model 65 Queen Air was provided with two 373kW Pratt & Whitney PT6A-6 turboprop engines. Identified initially by the company as the Model 65-90T Queen Air, this was evaluated by the US Army, from 17 March 1964, as the NU-8F. First flown on 22 June 1961, the Model 80 Queen Air had more powerful engines (283kW / 380-hp), but the Queen Air A80, introduced in January 1964, had increased wing span that allowed for operation at a higher gross weight. Final version was the Queen Air B80, incorporating a number of design and equipment improvements, and 11-seat Queen Airliners were available for each of these basic versions. A pressurised Model 88 Queen Air version of the Model 80 was introduced in August 1965. Generally similar to the Queen Air B80, it had structural modification of the fuselage to cater for pressurisation, and circular cabin windows. It was taken out of production during 1969 after 45 had been built. 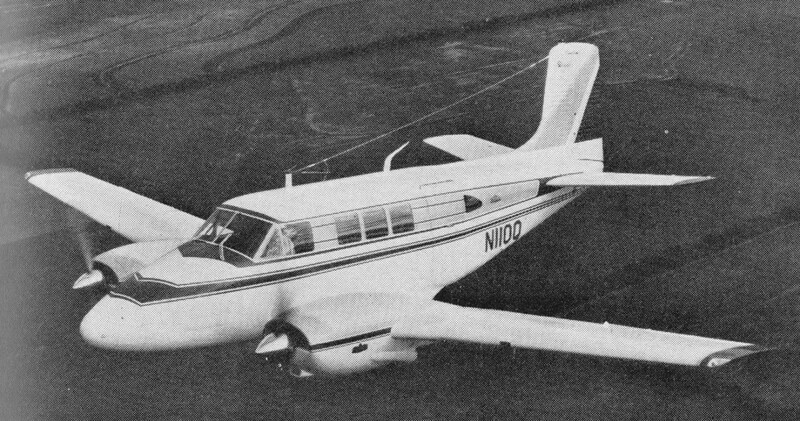 The Model 70 Queen Air was introduced in 1968. This was basically an A65 with the increased span wing of the B80. Manufacture of the Models 65 and 70 was terminated at the end of 1971, at which time production figures totalled 404 (including U-8Fs) and 42 respectively. Production of the Model 80 Queen Airs continued until the end of 1978, at which time approximately 510 had been built. In 1971 the rights to build and market a modified version were sold to the Excalibur Aviation Company and Swearingen Aircraft. The Excalibur 8800 is a modification replacing the engines with O-720s, low-drag engine nacelles, 3-bladed Hartzell props etc. Engines: 2 x Lycoming IGSO-480-A1A6, 340-hp. In-itial climb rate 1300 fpm. Takeoff distance (50’) 1700 ft. Landing distance (50’) 1980 ft. Initial climb rate 1375 fpm. Takeoff distance (50’) 1675 ft. Landing distance (50’) 2017 ft.
Engine: 2 x Lycoming IGSO-540-A1D, 380 hp / 283kW. Equipped useful load: 3278 lb. Payload max fuel: 1754 lb. Range max fuel 75% pwr: 1027nm/5.3hr. Range max fuel /55% pwr: 1348nm/7.8hr. SE ROC: 210 fpm @ 102 kt. Min field length: 2572 ft. Landing distance (50’) 2572 ft.
Fuel cap: 1200/1524 lb / 214-264 USG. Engines: 2 x Lycoming IO-720-A1B, 400 hp. Max TO wt: 8000 lb. Equipped useful load: 2600 lb. Payload max fuel: 1220 lb. Range max fuel/ 75% cruise: 886 nm/4.4 hr. Range max fuel / 55% cruise: 1156 nm/ 6.3 hr. SE ROC: 360 fpm @ 102 kt. Min field length: 2200 ft.
Max TO wt: 8800 lb. Equipped useful load: 3000 lb. Payload max fuel: 1416 lb. Range max fuel/ 75% cruise: 1047 nm/5.2 hr. Range max fuel / 55% cruise: 1341 nm/ 7.3 hr. SE ROC: 250 fpm @ 102 kt. Min field length: 2250 ft.